mRemote is a full-featured, open source, multi-tab remote connections manager that allows users to manage all remote connections from within its single user interface. 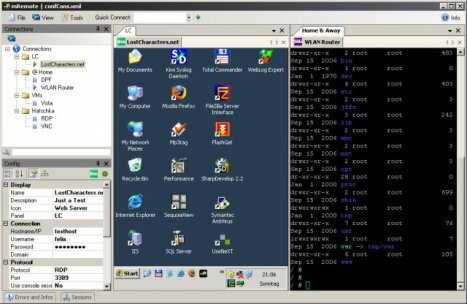 Computer users can run multiple instances of Remote Desktop, VNC remote control connections and other remote host access or transmission protocol applications on local PC. However, many programs have to be ran, occupying system resources and cluttering up Windows Taskbar. Free and Open Source, released under the GPL. Panels and tabs allow to group certain connections together, dock them to any side of the window or completely undock them and move them to another screen for example. Multiple supported protocols (RDP, VNC, ICA, SSH, Telnet, RAW, Rlogin and HTTP/S). Easy to organize and maintain list of connections. Inheritance makes it possible to store properties on folder basis and let the underlying connections inherit this info. Support for importing connections from Active Directory. Allows creating nested containers (folders) to categorize connections. “Quick Connect” feature to quickly open a connection without creating an entry. “Quick Search” feature to quickly find a connection while typing. Support for SCP/SFTP (SSH) file transfers. Assign icons to connections to easily identify purpose. Screenshot manager allows to collect multiple screenshots and save them all together or copy them to the clipboard. View remote session info and log off sessions (RDP). Show description tooltips when hoovering over connections. System tray icon with connection menu. Assign global credentials to use when no information is provided on connection basis. Host Up/Down (Ping) feature shows if the selected host answers to a ping. mRemote can be downloaded from SourceForge.net. Update: mRemote is no longer developed, and is transitioned to mRemoteNG, a fork of mRemote that provides similar functionality and bug fixes.